Clusters of mountains collide along the western wall of the Blue Ridge Mountains below the southern shoulder of the Great Smoky Mountains. Long and broad valleys gather rivers and waterways together creating a path whose watersheds flow beyond the western horizon. Steep ancient mountains reach to the sky like rugged stair steps to the heavens. Elongated mountain ridges force narrow peaks out of their crest like that of the red timber wolf's powerful jaw protecting its rightful domain. Cherokee County North Carolina, in the far western reaches of Western North Carolina is a haven of mountains, valleys, rivers and lakes, offering outdoor adventure to all ages. The county is dotted with historic towns and ancient sites longing to be explored. Mountain ways still survive here at a renowned folk school that has been influencing and inspiring thousands for nearly a hundred years. Cherokee County was one of the last strongholds of tribal lands belonging to the Cherokee Nation before their final exodus west along the tragic "Trail of Tears." These native lands still echo the language of the Cherokee people in the names of landmarks, waterways and districts. The high mountains of the Nantahala National Forest border the horizons to the north and east, with Tennessee's Cherokee National Forest to the west and parts of North Georgia's Chattahoochee National Forest to the south. Three rivers traverse the county's valley floor, joining together at Hiwassee Lake before making their journey to the western valley lands below. The Nottely River flows northward from neighboring Union County, Georgia. The Hiwassee River flows northwest across Cherokee County, finding its headwaters in the northeast corner of North Georgia's mountain country's western divide. 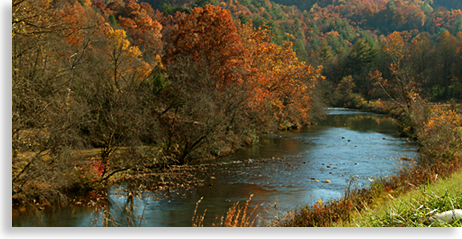 The Valley River, which originates in far eastern Cherokee County, flows westward across the mountainous valley regions uniting with the Hiwassee River before merging into Hiwassee Lake in the northern section of the county. This diverse northern backcountry offers an exciting outdoor adventure escape for those looking to getaway from the congested world out into the open spaces. For the outdoor enthusiast there's camping, hiking, biking, boating, water sports, canoing, kayaking and fishing, along with plenty of white water adventure close by and did I mention scenic driving tours? Cherokee County is situated between two major white water river gorges. Just outside the west end of the county is Tennessee's wild Ocoee River Gorge. At the eastern end of Cherokee County is the legendary Nantahala River Gorge with both a lower river gorge for white water rafting and kayaking, plus an upper river gorge ideal for fly-fishing with a waterfall canyon setting that you won't believe. For those who enjoy the more leisure atmosphere, there are picture book mountain towns and communities offering charm, hospitality, shopping, dining and lodging along with numerous historical landmarks marking the scene for Cherokee County's earlier days. Cherokee County is the last and by no means the least of Western North Carolina's counties, the region is considered a natural gateway to the west, or for eastward bound travels its an access to North Carolina's high country. The county was established in 1839 as the door closed on the Cherokee people who were given lands west of the Mississippi in accordance to the Treaty of the New Echota, signed in 1835 by the United States government and a small faction of Cherokee leaders. Settlers quickly migrated into the region claiming their new lands by lottery, taking up where the Cherokee left off, temporarily living in some of their homes and harvesting fields planted by the former residents. Most of the new arrivals came from Pennsylvania, Virginia and Tennessee. These early settlers were not the first old world visitors or their descendants to visit the area. Historical markers throughout the county tell their tales and lay their claims to local events, historical events the Blue Ridge Highlander will explore in this Cherokee County profile as we visit each region. Of our many outlets of choice throughout Cherokee County's towns, communities and local attractions we will begin with the historic county seat of Murphy, North Carolina before reaching into the high country and the valley towns along the local river basins. 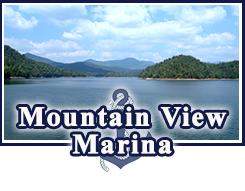 We are proud to represent the finest cabin rentals in Murphy North Carolina and the surrounding area. We have a nice selection of cabin and vacation rentals with excellent amenities in beautiful and peaceful mountain settings, at very reasonable prices. It is our pleasure to help you find the perfect cabin or vacation rental whether you are looking for a romantic weekend, a girlfriend's getaway, fishing trip for the guys or a family retreat. It is our goal to help you plan the best mountain getaway available. If you are looking for a great mountain getaway, look no longer, Brasstown Retreat is a peaceful luxury, mountain view cabin in the Overlook Brasstown Community close to John C. Campbell Folkschool. Brasstown is a quaint North Carolina mountain town near John C. Campbell Folk School. You will find great restaurants, a cute downtown with a nice variety of specialty shops. Murphy is also located between the Ocoee & Nantahala Rivers and conveniently located near the North Georgia Mountains. Luxury "Pet Friendly", Hot Tub Cabin located in Murphy NC. Perfect View Hideaway offers great views with lots of covered and uncovered decks. This cabin has upscale furnishing and exceptional decor throughout. 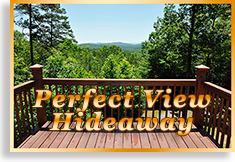 Perfect View Hideaway has 2 full living/great rooms both with large flat screen TV's and satellite service. Both living areas also have gas fireplaces. Pet Friendly, Creek front Cabin Rental. Sit on the deck wonderful creek front cabin in the North Carolina mountains and rock your cares away while listening to the fast rushing creek. This pet friendly cabin is a great choice for a small family or couples that want something quiet, remote and peaceful. Davis Creek is stocked with trout in mid spring making it a great fishing destination. Plenty of room to roam on the grounds and a fire pit that allows time for story telling and s'mores. >Bent Oaks is close to town and still off the beaten path. This 3-bedroom cabin (one queen in each) has everything you need for a great mountain getaway. There are also twin beds in the upstairs loft for the kids. The master bedroom is large, has a gas fireplace and a glass door leading to the deck where you will find a hot tub to fit 4 comfortably. The master bathroom has a jacuzzi tub and shower. The kitchen has is fully equipped with a separate dining area and a grill on the back deck. Luxury Pet Friendly, Cabin Rental located in Murphy NC. Fox Den is a recently built cabin offering mountain views with covered and uncovered decks. This custom designed cabin has upscale furnishing and exceptional decor throughout. Fox Den has 2 Master Bedrooms with private baths. King master has a rustic stone shower in the bathroom. Second Master has a Queen Bed. There is also a Queen size sofa bed in the living room. Fox Den has a 3 large flat screen smart TV's with Cable one in each bedroom and one in the living room, also wireless Internet service throughout. If you are looking to get away to the mountains in style, this is the cabin for you. This sweet cabins offers 2 bedrooms, 2.5 baths and 2 fire pits. Just .2 miles of pavement (not gravel here) from Highway 64 and 5 miles from the Tennessee lines allowed quick access to the Ocoee Recreation Area for a great deal of adventure fun. One bedroom (queen) is located on the first floor and the second is the loft (king) offers and additional 1/2 bath and small office area/reading nook. The kitchen is well equipped and has beautiful granite counter-tops. The Flat screen TV offers satellite service and the cabin comes equipped with Internet and wifi. The first fire pit is located in a gazebo off the main deck and is gas for easy convenience. The second fire pit it down a short walking deck staircase and is wood. Great for making s'mores and telling stories. The beauty and solitude of the Mountains make our KOA an ideal spot to settle in and relax for a while. Located one mile from Harrahs Cherokee Valley River Casino, we offer spacious RV Sites, fully furnished Deluxe Cabins, and Tent Sites along the scenic Valley River. At the campground, guests can wade into the water to cast their lines for trout in the stocked river, take a dip in the pool, catch up on news and sports in the game room, spend time with family and friends, and simply relax. Then get settled in and head out to explore our beautiful area. You're just a short ride to the Cherohala Skyway and Tail of the Dragon. Visit Fields of the Wood Park, hop on a mountain train, or join in a class at the famous John C. Campbell Folk School. Piney Knob Hiking Trails are just around the corner. Fires Creek, Lake Hiawassee, Nantahala, and Fontana are great natural areas to visit.